Founded in 1976 by wildlife lover and expert Martine Colette, the Wildlife WayStation is a national non-profit, holding rehabilitation, medical and problem solving refuge for native, wild and exotic animals. Located in California, at the Angeles National Forest, north of the San Fernando Valley, the Wildlife WayStation was a safe haven for both native and exotic wildlife dedicated to their rescue, rehabilitation and relocation. It was a safe haven until devastating fires hit, which now is dangering the lives of its inhabitants in the canyon home, calling for evacuation for the first time in its history. About half a dozen chimps were evacuated from the smoke and the flames to a safer place. Their screams brought tears to the eyes of Martine Collette. This is the first time they had to evacuate the animals, and it will not be an easy task to move them back either. For now, they are being taken to the Los Angeles Zoo until the fires in the area are contained. But how do you move a 300-pound lion? The task is not an easy one. These animals come from all over the world and from many different situations. The WayStation’s long-standing commitment is to accept any animal, no matter what the problem, free of charge and with no reservations. In short, no wild or exotic animal in need is ever turned away. Since its inception, the Wildlife WayStation has provided shelter and care to over 75,000 animals. 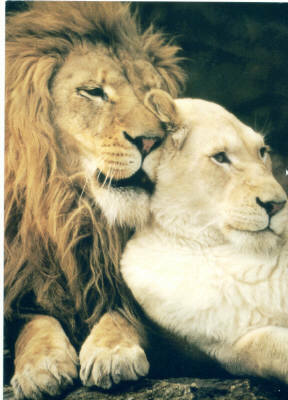 An animal lover myself, I often wondered why dogs are so quick to wag their tails, cats are so quick to purr, and lions demonstrate that lion-hearted love despite that they are ferocious predators? Even those cats and dogs that have been lonely, abused, and betrayed. As is true of all people, although we sometimes tend to forget. A combination of staff and volunteers, each of whom is dedicated to the health and happiness of each and every animal, mans the Wildlife WayStation. The small paid staff and large group of volunteers manage the day-to-day operations maintaining the ranch and providing nurturing and support to the animals. The volunteers also facilitate the educational process and the dissemination of information through outreach programs, and special events. The Wildlife WayStation is a national non-profit, charitable organization, supported solely through donations, bequests, fundraising events, memberships and animal sponsorship programs. Supporters and donors of the Station include Nicollette Sheridan, Sharon Stone and Keanu Reeves, among many others.